10 Stylish Bags We Are TOTALLY Drooling Over This Week! If there’s a bag you see and can’t stop yourself from buying on whenever you see it, you have a soft corner for bags! And you’ll agree that bag love is true love. We can never have enough of them and they’re undoubtedly the best accessory an outfit needs. Which is why we put together 10 of the most stylish bags online at the moment. Time to start shopping, ladies! Fruit print on a bag? Oh yes! Make your outfit a little juicy with this watermelon tote bag. We think it’s the perfect arm candy you need! This pastel blue and white sling bag is all things adorable! It exudes a feminine charm that we just can’t resist. The embroidered bird and flowers are an added bonus! 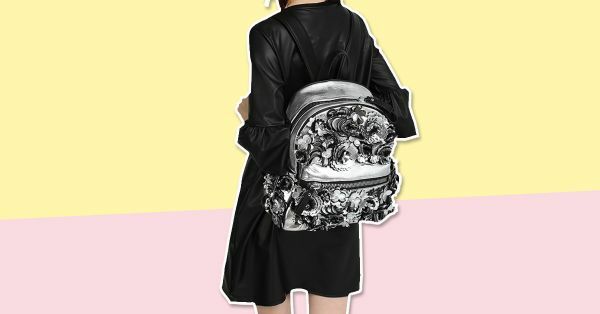 We’re in love with this metallic floral backpack. Do we really need to tell you why you must swap your basic backpack with this one? With florals being the in thing this season, there’s no reason to not grab this beauty right away! It’ll add colour to your look and be the fun element nobody can ignore. A tan tote bag never goes out of style. You can carry it to work, to the beach and just about anywhere else. A multipurpose bag like this one looks better in the hand than at the shopping rack! Not only will this printed sling add a pop of colour to your look, it’s also exactly what you need when you want your bag to do all the talking. Pair it with a plain shift dress for a balanced look. The black sling bag got a whole new twist! With leopard print detail and a zip closure in the front, this sling is just the kind of accessory you need to dress up your look! There so no such thing as too many bags for a girl. This grey backpack with bright tassel details is the perfect investment to make this season! If you carry your laptop wherever you go, you need a bag like this on in your life. It’ll fit in your laptop and other daily essentials and look good with whatever you wear! Because you don’t need to live in a fantasy land to believe in unicorns! Up your workout wardrobe with this duffle bag that’ll carry all your gym essentials.